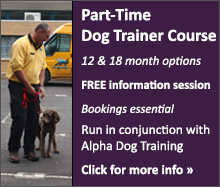 Alpha Canine Professional (ACP) offers two professional dog trainer course options for those looking to enter the dog training industry or for instructors looking to improve their skills and knowledge (conditions apply). The first option is our part-time course that runs over a 10 or 16 month period. Due to the longer duration and overall commitments, this course is suitable for Melbourne based trainees only. 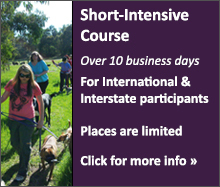 The second option is the short, intensive course that runs over a two week period (Monday – Friday with a weekend in between) and is better suited to those from travelling from country areas, interstate or overseas, or anyone who is unable to commit to the longer course. ACP dog trainer courses have been developed by dog trainers for dog trainers - teaching only the most effective, practical and relevant methods that will be used when working with real owners and their real dogs - dogs that often have real behavioural issues. Not all dog training or handling courses are the same. ACP has gone to great lengths to validate our methods in the real world and goes far beyond the standard and textbook approaches to teaching canine learning and behavioural theory. Experience is not built on theory alone! The value for money service on ACP courses is second to none, especially when you consider the invaluable opportunities to work 'hands-on' with many different dogs whilst applying (and validating) the very methods you are learning. Central to all ACP courses is the handling and training of many different dogs, giving trainees the unique opportunity to apply and develop their skills ('hands-on') as they learn. 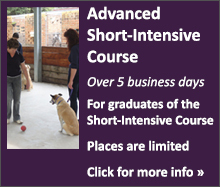 All trainer courses include lectures that teach canine behaviour and psychology in an easy to understand manner. When combined with the practical work of actually handling and training dogs, the theory really comes to life. Real depth and credibility is added to the system when the consistent thread of results in both obedience and behaviour shaping starts to literally tie everything together. The system and methods taught on ACP courses have been developed from the successful businesses within The Alpha Canine Group. Our training concepts, theories and principles are pioneering a new understanding of how to prevent and rehabilitate undesirable canine behaviour in a manner that breaks away from traditional, popular and academic theory. That means no food bribes, no complex theory and no selective methods that can’t be demonstrated in real-time! Everything we teach is validated through active demonstration and/or video examples of the methods in action - real owners, real dogs and real problems. Whether it's seminars, lectures, workshops, short intensive courses or part-time courses, ACP teaches methods that work right before your eyes, making our theory relevant and the application of method practical. By the end of your course you will truly understand what you have learned because you will have actively applied the theory and methods on real dogs to achieve very real and tangible results!